McKinley was a popular President, and easily won reelection in 1900. William McKinley was one of the best liked Presidents. Why would anyone want to kill him? By all accounts, William McKinley was a warm, friendly and agreeable fellow. Born in 1843 in a small Ohio town, he was raised in a hard-working, devout Methodist family, with education a high priority for their children. At eighteen, McKinley enlisted as a private in the Civil War, and remained for the entire four years. He was popular among his superiors and his peers, despite the fact that he had none of the vices-of-camaraderie. He did not smoke, drink, swear, dance, play cards, gamble or chase women. The soldiers liked him anyway, and never thought him sissified or priggish. By the end of the War, he had become a brevet Major, and an aide de camp to Ohio General Rutherford B. Hayes, who encouraged the younger man to read law and become an attorney. McKinley took the advice, became a lawyer, moved to Canton, Ohio, a growing community, and proceeded to join every civic and fraternal association in town. He was a popular member with dozens of friends. His law practice grew. He married Ida Saxton, the daughter of the town’s most prominent banker. In 1876, he was elected to Congress, and served for seven terms, making even more friends. It is said that while he may have some political adversaries, he had no enemies. It is further said that when a colleague rose to argue a point with him, they usually apologized to him first. Then he became Governor of Ohio. All told, he was an extremely well-liked man, much like Ike and Ronald Reagan who followed many decades later: While you may not agree with him, it was practically impossible to dislike the man! 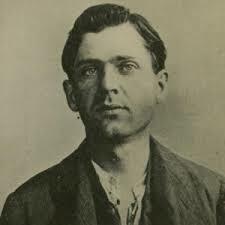 Leon F. Czolgosz, anarchist and assassin. Loners, and even a fairly new expression, a loner-loser, has become a common description for many terrorists of all kinds today. Most terror attacks, whether they are international, religious, racial, economic or otherwise, and whether they are carried out by bomb-throwing, suicide attacks, vehicle driving, or out-and-out shooting, usually point to the perpetrator as a loner, or someone who has never been able to succeed in a societal atmosphere. They find it hard to find work or make friends. One commonality however, they find it very easy to blame others for their failings. Such a man was Leon Czolgosz (1873-1901). He was born and raised in Michigan, the son of a hard-working Polish immigrant, considered lower middle-class. Nevertheless, his education ended when he was fourteen, and he became a laborer with varying amounts of skill. In the early 1890s, there was an economic panic (recession), and Czolgosz became unemployed, along with thousands of other men. Now, essentially an out-of-work loner at twenty, he became interested in the “anarchist” movement in the United States. Their adherents believed that governments, and authorities in general, were responsible for the woes of the world, and in particular, the economic woes. Anarchism had begun in Europe in the early-to-mid 19th Century, and had strengthened increasingly in the later decades. Violence was their nihilistic activity of choice: Tear down governments (authorities) via assassination of rulers. Czolgosz (pronounced Chol-gotch, but few people could pronounce it) began to read the anarchist newspapers and magazines and attended their rallies. If he attended any smaller meetings or joined any specific clubs, it is vague. Anarchists, by their very essence, loved to talk and pontificate, philosophize and write polemics, but they shunned structured organizations and hierarchies. In September, 1901, President McKinley was six months into his second term, and at the height of his popularity. The country, optimistic about its new century and opportunities, flocked to the Pan American Exposition in Buffalo, New York to celebrate its progress. The President planned to attend. William McKinley shook hands with the crowd at the Pan American Exposition. Always affable, McKinley was shaking hands with a crowd of five hundred people waiting in line for the honor. Toward the end of that line was Leon Czolgosz, his hand wrapped in a bandage-like handkerchief, concealing a pistol. The rest is history. The assassin pumped two bullets into the President, and was immediately pummeled by the crowd, which was quickly becoming a mob. The POTUS admonished them “not to hurt” that man, as he was taken away. Despite the fact that McKinley was believed to be out of danger and expected to recover, infection set in, and he died within the week. Czolgosz was now not only an assailant, he was an assassin – of the President of the United States. 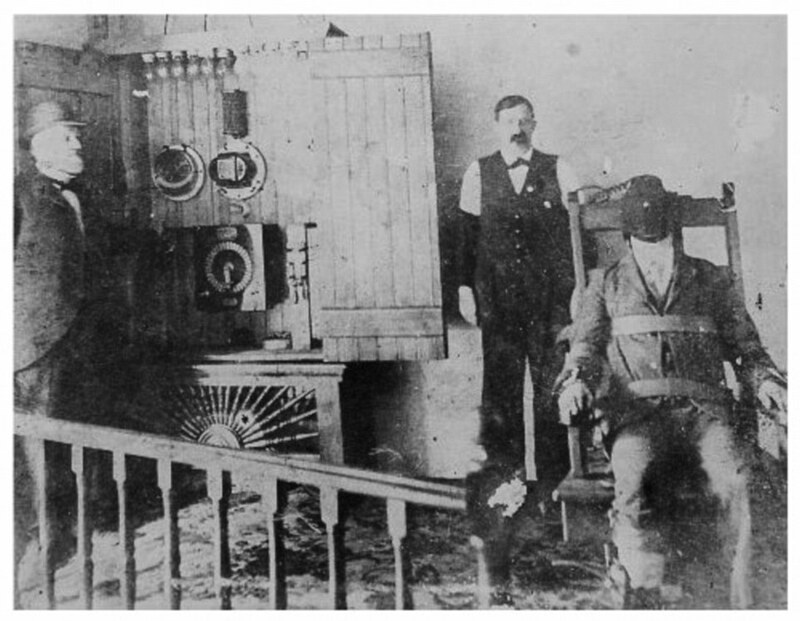 Actual photographs were taken of Czolgosz at his execution. Of course there was a trial. Of course there was an attempt to portray Czolgosz as insane. But most of the general public still remembered the assassination of Lincoln, and of James Garfield twenty years earlier. The mood of the country was not inclined to be overly sensitive to the noisy anarchists let alone generous toward political assassins. Nor did Czolgosz help his case. He was unrepentant, saying, “I killed the president because he was the enemy of the people – the good hard working people….I am not sorry.” This of course did not sit well with the people, including the good hard working people. The jury deliberated briefly. He was found guilty, and sentenced to die in the electric chair. The general reaction was to get it over with, good riddance and to never speak his unpronounceable name again. With little publicity, before interment, the body was destroyed with quicklime to deter souvenir hunters or martyr-makers. Concerned that lime was insufficient to decompose the body, they added sulfuric acid. Some chemists claimed that the combination of the lime and acid merely created plaster of paris. Whether it did or did not is irrelevant. The assassin with the unpronounceable name is dead, buried and all but forgotten, which is exactly what was wanted in 1901. This entry was posted in A POTUS-FLOTUS Blog, Nifty History People, William McKinley and tagged American history, Feather Schwartz Foster, history, Leon Czolgosz, McKinley assassin Czolgosz, McKinley's popularity, political anarchists, President William McKinley, presidential assassins, presidential assinations, Presidential history, Rutherford B. Hayes, the assassination of McKinley, the Pan American Exhibition in 1901, US history, White House history, William McKinley, William McKinley's assassination. Bookmark the permalink. Interesting. I’d only read/heard bits and pieces of this story previously.